Lean Cuisine dinners are certainly convenient. After all, you get correct portion sizes in a reasonably nutritious, low-calorie meal. The question is, can you really lose weight by eating them? You can, but weight loss requires more than simply eating prepackaged meals for optimal success. Can You Lose Weight Eating These Meals? There are lots of benefits and drawbacks that go with eating Lean Cuisine meals, and it's important that dieters are aware of these factors to avoid potential pitfalls. It is possible to lose weight eating these prepackaged meals, but it takes more than just throwing a few frozen meals in the microwave. It's also necessary to adopt a Lean Cuisine diet plan, which includes making smart choices when it comes to snacks, hydration and exercise. Convenience - The prepackaged meals require no planning and no measuring. Instant portion control - Portions are an important part of weight loss and weight maintenance. It's all too easy to overeat, especially considering the large portions most people have become accustomed to. Prepackaged diet food can help dieters as a reference to appropriate portions. Saves time - The ultra-convenient approach can work well for people with busy schedules, but it can benefit people who have to cook for an entire family as well. Rather than cooking two meals, one for the dieter and one for non-dieters in the household, the prepackaged option offers a quick alternative that requires no more than a few minutes in the microwave. 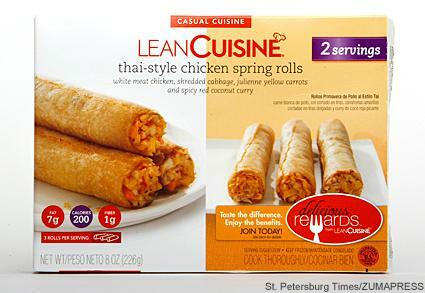 Preservative-free options - Lean Cuisine offers over 90 meals that are preservative-free. There are two main drawbacks to eating Lean Cuisine frozen dinners. The first is the amount of sodium they contain and the second is the fact that dieters receive inadequate guidance for sustaining a healthier lifestyle. Sodium tops the list of concerns for dieters. Too much sodium can cause water retention and can contribute to health problems. According to the Mayo Clinic, you should limit your sodium intake to no more than 2,300 milligrams each day. That recommendation drops down to just 1,500 milligrams if you're over age 51, you're African-American or you already have a health complication such as high blood pressure, kidney disease or diabetes. If you plan to eat Lean Cuisine, you'll want to keep track of the amount of sodium in each of your daily meals. According to the Nestle Nutritional Information for these meals, a number of the dinners contain over 30 percent of the recommended daily intake of sodium. A less obvious drawback is that the dieter does not learn how to prepare meals for herself. Although the prepackaged food can offer a general idea of what a reasonable portion looks like for weight management, they do not provide an opportunity for the dieter to practice preparing meals properly. As a result, the dieter runs the risk of putting weight back on after going back to traditional meals. It is important to note that Lean Cuisine is not a weight loss program like Jenny Craig. This can be somewhat beneficial because the dieter has to take initiative in supplementing meals with whole foods. The convenient meals work extremely well with a Weight Watchers program when using the products as diet aids. Exercises for losing weight can make a considerable difference for any weight reduction program. Healthy breakfast foods give the body the necessary metabolic lift first thing in the morning. Nutritional snacks keep energy levels high while preventing the body from going into starvation mode. Creating a weight loss program that incorporates Lean Cuisine is a viable option that offers convenience and good nutrition. The sodium content can be a considerable drawback, but just like every other aspect of dieting, the foods can help you lose weight if used in moderation. Rather than eating the prepackaged meals two or three times each day, some dieters can benefit from incorporating the meals into their eating plans two or three times a week.